In life there is no shortage of stress. Between work, family, and financial concerns, people experience stress for all sorts of reasons. However what is seldom realized is how exactly our stress affects us and what may happen as a result. Like many people, you may need a mouth guard for teeth grinding. Tooth grinding or bruxism is a common but disconcerting issue that typically affects people suffering from excess stress or anxiety. Teeth grinding affects approximately 10% of the adult population today. Left untreated it can cause an unwarranted amount of problems that, in a cruel twist of irony, may cause additional stress. Mouth Guard for Teeth Grinding: Do you know what really grinds my teeth? Although the simple act of clenching or grinding your teeth might not seem like a big deal, perhaps the reason why bruxism is so problematic is its chronic and unconscious nature. While recognizing bruxism while you’re awake might be a bit of a challenge, (as typically people grind and clench without noticing it) recognizing it while sleeping is considerably harder. Unfortunately this is often the case as many people, while unbeknownst to them are grinding and clenching throughout the night, ultimately disrupting their sleep and damaging their teeth. According to the Bruxism Association, 70% of bruxism cases occur as a result of stress; however, there are multiple factors that can cause or contribute to the occurrence of bruxism. One of the basic causes of tooth grinding or clenching is a malocclusion or jaw misalignment. Malocclusion can be caused by misshapen or extra teeth, and can be corrected by dental braces or extracting the extra teeth. Another and more complicated explanation for bruxism to occur is a reaction to prescription drug use or stimulants. This can sometimes be experienced by patients using medications to treat depression such as Prozac, Zoloft or Paxil, and can be further triggered by the addition of caffeine products such as coffee or energy drinks. However as mentioned previously, stress, anxiety, and psychological adversity are the primary contributing factors to bruxism as suffers often unconsciously bite down and clench as a natural reaction in dealing with tense thoughts or situations. This may not only be a result of coping with excessive stress, but also as a result of failing to properly manage or release the stress experienced. To combat the damaging effects of bruxism, Dr. Charles R. Kimes, DDS at Overland Park Dentistry has begun implementing the use of a custom mouth guard for grinding teeth, to prevent his patients from continuous grinding and or clenching. If you chronically suffer from bruxism, ask Dr. Kimes if he recommends using a specialized mouth guard for grinding teeth to prevent any further wear or damage to your teeth. Using dental impressions, Dr. Kimes will custom fit the mouth guard to your teeth, creating a protective buffer between your upper and lower jaw. This prevents any grinding from occurring. The type of mouth guard for teeth grinding created are typically varied depending on the patient’s comfort level, and reason for use. For daytime use, Dr. Kimes typically create a smaller, transparent mouth guard that a patient can comfortably wear without anyone noticing. 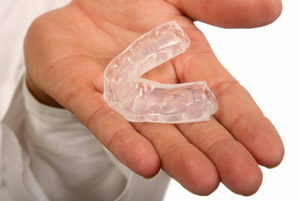 On the other hand, nighttime a mouth guard for grinding teeth are larger, stronger, and sometimes more noticeable. This is due to the majority of bruxism suffers being primarily affected at night, in which the grinding or clenching may likely be worse. Additionally your mouth guard for grinding teeth can be created to match your comfort level, as both soft and harder materials are available to be used to create your own particular mouth guard. Mouth Guard for Grinding Teeth: Fix the problem! From what you’ve read, it’s clear that bruxism can result in a whole hornet’s nest of problems, and that’s extra stress that you certainly don’t want! If you notice excess grinding during the day, or suspect that you may be clenching and grinding through the night, then you should see Dr. Kimes to get a proper diagnosis and fit for a custom mouth guard for teeth grinding. As stressful as life can be sometimes, there is no need to add to it! Schedule your appointment at Overland Park Dentistry and visit Dr. Kimes soon, and put your mind and your jaw at ease.